I started this outdoor project a month ago, it was originally meant as a way to keep excess harvested fissidens and get them to continue growing outside without taking up valuable space in my indoor tanks (and with minimal attention required). To start with, i layer strands of fissidens on pieces of coconut shells (didn't bother to manually tie them on, the fissidens will eventually root in and attach on their own anyways) and then add abit of water into the container. I prefer to use coconut shells as the base as they have a more natural curved shape once the fissidens establish (like small green hills), compared to using steel meshes which tend to create a rather flat artificial look. This process is sort of like a "dry start method" (aka DSM) whereby the plants are grown emersed for a while before being submerged. 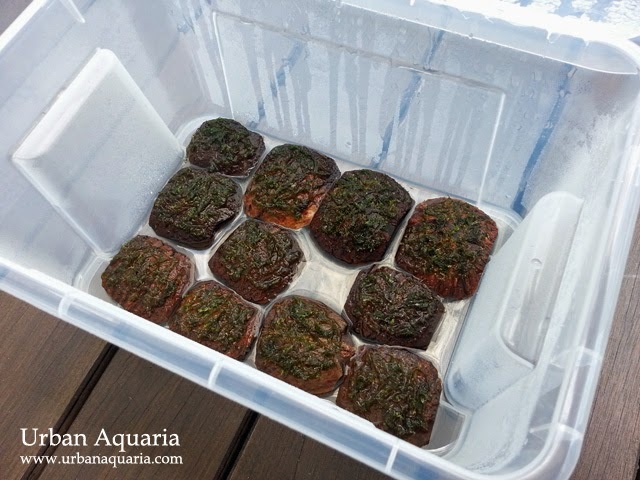 The bottom layer of water will naturally wick up the coconut shells to keep the fissidens hydrated during this period of time. The containers i use are just transparent IKEA plastic boxes. The lids are kept closed at all times to retain high humidity in the container (very important for fissidens undergoing DSM) and also to prevent mosquito breeding. In the photo above, the top container has fissidens growing on coconut shells, while the bottom container has loose fissidens just grown floating in the water. The containers are stacked up to save space. After 1-2 weeks, once the fissidens attach to the coconut shells, i fill the container with water and they will continue their growth submerged. On a weekly basis, i do a full water change with de-chlorinated water, no fertilizers added. 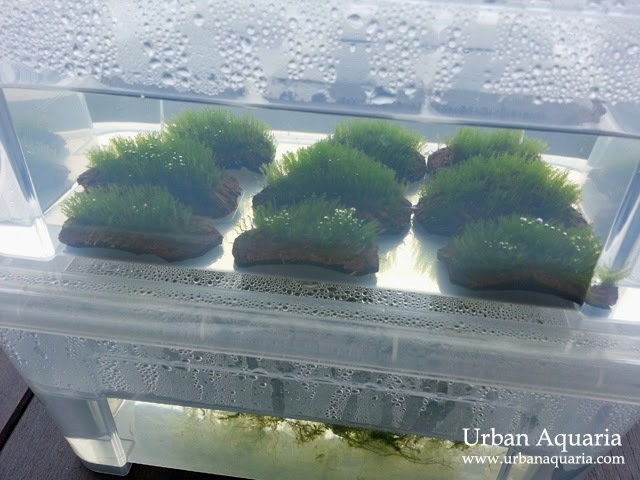 So far, i've not spotted algae in any of the containers, even in the presence of direct sunlight. Most likely the limited nutrients available are all used up by the fissidens and the sealed environment probably helps prevent external contaminants/spores from being introduced too. As you can see, there is "pearling" (excess oxygen bubbles from active photosynthesis) even from the fissidens... sunlight is a very powerful light source indeed! Due to direct sunlight exposure and the covered container environment, the water temperature in the containers can often times reach 31-32°C, but interestingly the fissidens didn't seem to show any signs of deterioration and instead seem to grow even faster and greener (compared to my indoor tanks), so i guess fissidens can adapt and thrive in high temperature conditions too. Yes, the coconut shell will eventually be placed in an aquarium, its similar to using hardscape like driftwood. Most people use coconut shells to create little caves for fishes to hide on, or like in my case, as smaller pieces to attach plants on. maybe due to direct sun and yesterday is a hot day. i have been putting for 1 week.. but i didnt see any grow..
also didnt seen any growth on them. Did i miss some of your important steps ? 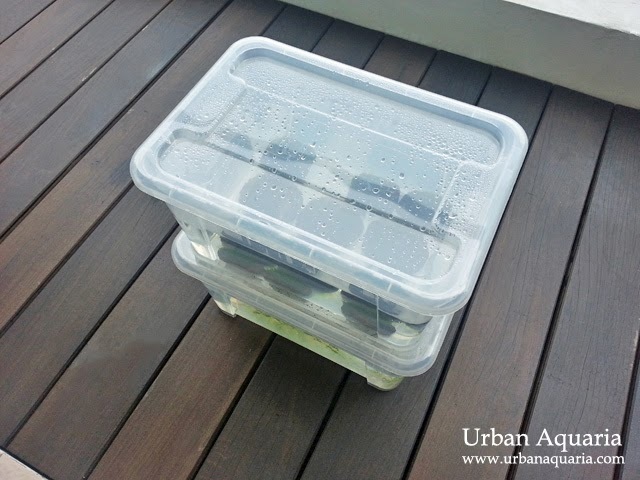 If the container water is reaching those higher temperatures, then it means its under too much direct sunlight, shift the container to another area which has less sunlight... you have to adjust its placement until you find the best position for it to get sunlight yet not heat up so much. For really hot days, opening the container cover slightly can also help vent out the trapped heat and promote some air circulation. Now, my box (same like your IKEA white container), contains the xmas moss, anchor moss and fissiden. All mosses turning into white (maybe it is way too hot, I have measured, it is 41 degree). Fissiden, it is still ok, but did not show any sign of growth. Yeah, 41°C is way too hot for the mosses to grow, even if they could it'll take a lengthly period of adaptation before they can do so. Fissidens are generally very hardy so its possible they may be able to tolerate higher temperatures better, but the growth is stalled due to encountering extremes in environmental conditions. Hopefully in the shadier area with less direct sunlight and lower temperature, the moss can recover and grow again.